The military ranks of the German Empire, were the ranks used by the military of the German Empire. It inherited the various traditions and military ranks of its constituent states. The German Army from 1871 to 1914 inherited the various traditions and military ranks of its constituent states, thus becoming a truly federal armed service. Musketeer (Musketier, Prussian army infantry regiments), Infantryman (Infanterist, Bavarian army infantry regiments), Soldier (Soldat, Saxon army infantry regiments), Gunner (Kanonier, foot artillery), Pioneer (Pionier, pioneer branch). Other unit-specific enlisted ranks were: Fusilier (Füsilier), Grenadier (Grenadier), Huntsman otherwise Light-Infantryman (Jäger), Dragoon (Dragoner), Hussar (Husar), Cuirassier (Kürassier), Uhlan (Ulan), Fusilier Guard (Garde-Füsilier), Grenadier Guard (Garde-Grenadier), etc. Lance Corporal (Gefreiter); up until 1918 the only rank (with exception of Obergefreiter in the foot artillery) to which an enlisted soldier could be promoted, the rank was a deputy rank to the Corporal (Unteroffizier)[a] rank. Senior Lance Corporal (Obergefreiter); established in the Prussian Army from 1846 to 1853, reestablished in 1859, then in foot artillery only, replacing the artillery Bombardier rank that had been introduced in 1730. One-Year Volunteer Enlistee (Einjährig-Freiwilliger): despite the name, one-year volunteers were actually conscripts who served a short-term form of active military service, open for enlistees up to the age of 25. Such enlisted soldiers were usually high school graduates (Matura, Abitur), who would opt to serve a one-year term rather than the regular two or three-year conscription term, with free selection of their chosen military service branch and unit, but throughout were obligated to equip and subsist themselves at entirely their own cost. In today's monetary value, this could at bare minimum cost some 10,000 euro, which purposely reserved this path open to officer-material sons from mostly affluent social class families wishing to pursue the Reserve-Officer path; it was the specific intention of Wilhelm II that such Reserve-Officer career path should only be open to members of so-called "officer-material" social classes. On absolving their primary recruit training and shorter military service term, those aspiring to become Reserve-Officers would have to qualify and achieve suitability for promotion to the Gefreiter rank and then would continue to receive further specialized instruction until the end of their one-year term, usually attaining and leaving as surplus Corporals (überzählige Unteroffiziere) (Reservists), with the opportunity to advance further as reservists. Enlistees who did not aspire to officer grade would leave at the end of their one-year term as Gemeine[b] (Ordinary soldier) enlisted rank (for example Musketier or Infanterist) and a six-year reserve duty obligation. Eligibility for this specific one-year path of military service was a privilege approved upon examining the enlistee's suitability and academic qualifications. Note: Einjährig-Freiwilliger and Kapitulant were not ranks as such during this specific period of use, but voluntary military enlistee designations. They, however, wore a specific uniform distinction (twisted wool piping along their shoulder epaulette edging for Einjährig-Freiwilliger, the Kapitulant a narrow band across their lower shoulder epaulette) in the colours of their respective nation state. This distinction was never removed throughout their military service nor during any rank grade advancements. Cadet (Fahnenjunker, ranking between Sergeant and Vizefeldwebel) – served as cadets in the various military academies and schools. Critics long believed that the Army's officer corps was heavily dominated by Junker aristocrats, so that commoners were shunted into low-prestige branches, such as the heavy artillery or supply. However, by the 1890s, the top ranks were opened to highly talented commoners. The Imperial German Navy's rank and rating system combined that of Prussia's with the navies of other northern states. ^ Duden; Origin and meaning of "Korporal", in German. ^ Duden; Definition of "Gemeine", in German. ^ Duden; Definition of "Kapitulant", in German. 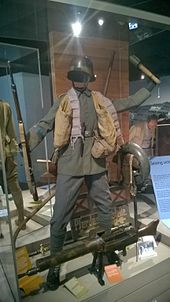 ^ Several German armies and national contingents, including Prussia and Bavaria, traditionally used two different captain ranks that originated with the ownership of units. By the end of the 19th century that dual-system had been gradually phased out and replaced by a single rank. Wikimedia Commons has media related to Military rank insignia of the German Empire. ^ a b c d e f "Dienstgrade und Uniformen." Kleinen Kreuzers “Dresden” (I). Retrieved 2017-09-22. This page was last edited on 20 November 2018, at 10:36 (UTC).